Are you having trouble maintaining a consistent quiet time? Are you discouraged because you don’t know where to start? Maybe you want to study your Bible more, but don’t know how to get started. One of the things I’ve found is that a lot of women struggle with taking their quiet times deeper. It is very easy to pull out our Bible, read a Psalm or even a chapter out of another book, close it and walk away thinking we’ve had our quiet time. But just like me, a lot of my readers don’t feel that reading is enough. And truly it isn’t; especially for believers who have walked with Jesus for a longer period of time. At some point, you need to begin studying God’s Word: ask probing questions, examine Greek and Hebrew words, and more. The trouble is, our schedules don’t always allow for unlimited time in Bible study. I’ve also discovered that a lot of quiet time resources are very complicated…and when something is complicated, I don’t usually stick with it. That is why I created My Quiet Time Journal. Borrowing from my own method of Bible study, I created this simple journal for you to use. It only has 9 pages and they are all in black-and-white, so you save on ink. Plus, you can choose to download just the pages you plan to use. My Quiet Time Journal will now replace the monthly 30 Day Prayer Challenges. As I explained in an earlier post, a few months ago I began to re-evaluate everything I was doing with my blog and why. I made a big shift away from just content to creating Bible Studies, and have begun using the 30 Day Prayer Challenges as part of those studies. But I felt it was time to offer something new as a replacement for the challenges. Something that my readers have indicated is a need, but something simple….useful, something that will challenge you take your daily walk with Jesus to a new level. 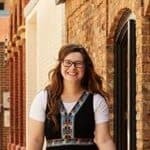 I have followed Rosilind Jukic for the six years of my blogging journey and I have seen her grow along with her blog. She cares deeply for each individual who frequents her blog and has the desire to encourage and equip her readers. The latest on her blog is, “My Quiet Time Journal” and I am sure you will love it as much as I do. This awesome journal can be added to your 3-ring Bible journaling notebook where you can put all your journaling pages in one place. Colored pages are pretty until you buy more ink! Rosilind thought of that and designed each page in black-and-white. Several pages of the journal capture your attention with artistic banners and shapes that you will write the answers to simple questions. You will also write the impression God left on your heart from the verses you read that day. There is also a whole page for your personal journaling notes about the passage. Who doesn’t need more space?! Then there is a whole page for those of us who want to worship and meditate on God through art. Rosilind’s journal includes the S.O.A.K. method (Scripture, Observation, Application, Kneel in prayer) which makes this a comprehensive way of approaching your Quiet Time. I prefer a journal that allows me to study the Bible and journal what the Lord is laying on my heart without having to fill out questions that are irrelevant to my style of studying. I love the framework that “My Quiet Time Journal” provides without trying to fit my experience and interaction with the Lord into the wrong shaped box. I know you will love this journaling tool as you use it month after month. 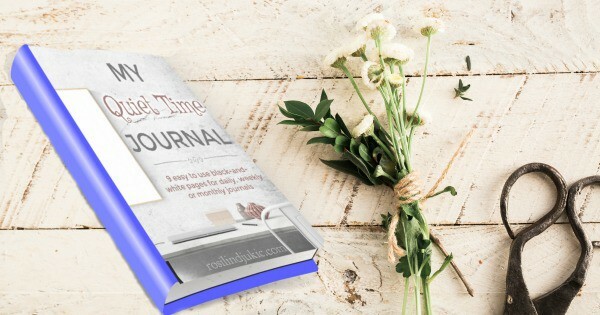 Rosilind’s Quiet Time Journal is transforming the way I meet with God. I’m not just reading my Bible, but by using the study prompt I’m able to continually feast on it. My prayer time has been impacted in the most beautiful way! Rosilind Jukic’s beautifully designed quiet time journal encourages us to spend time in God’s presence through Bible study, prayer, and personal reflection. I appreciate that the pages are not only visually appealing, but they also contain thought-provoking questions that direct us to examine context, employ the S.O.A.K. method, and consider a personal application. The journal also give us a place to record prayer requests, as well as answers to prayer. Jukic’s journal touches on each aspect of what an effective daily quiet time should involve, and is useful for both quiet time veterans as well as those who are just getting started! 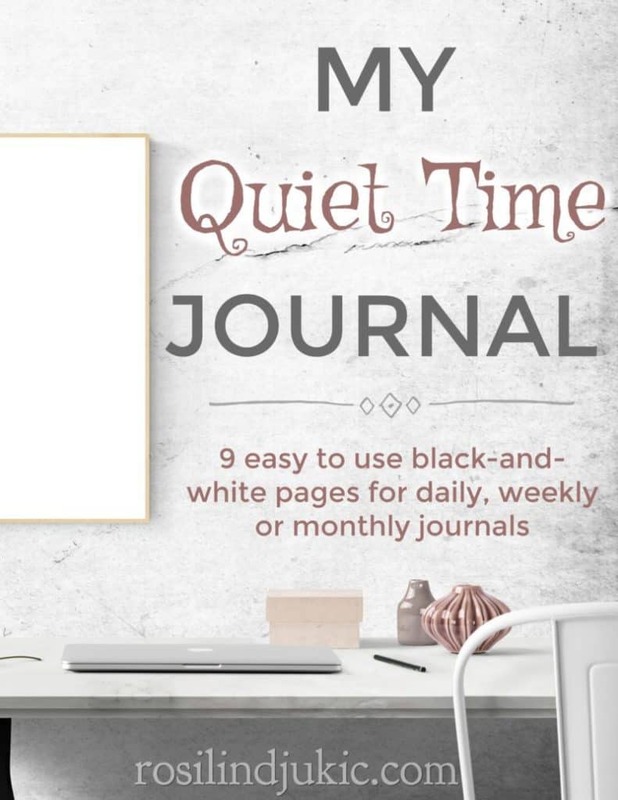 Get the My Quiet Time Journal Today! When you type in your email below, you will receive a link to the My Quiet Time Journal right in your inbox. With that link, you can either download and print the entire journal, or just the pages you plan to use. 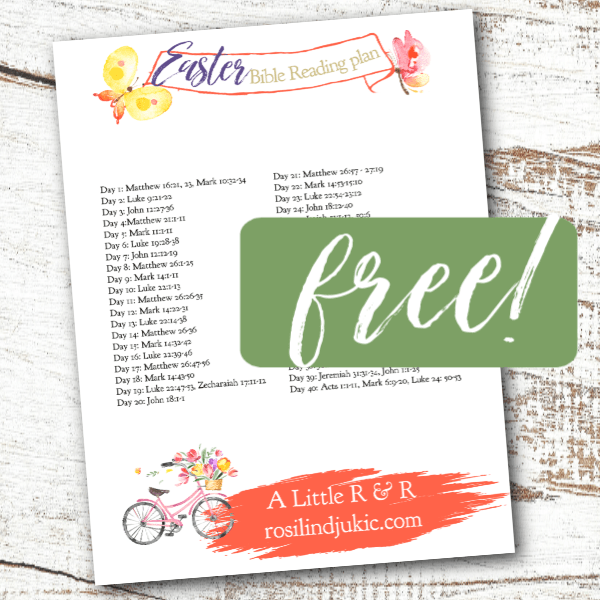 Plus, you will find links to other free resources that are useful for your quiet time and home! Thank you so much Rosilind, This is so beautifull the way you made it. I found you two years ago and I have visited your blog every day. This new format with all the advertisements is very distracting. I understand your decision to allow them to use your blog but it interfering with me getting through your message. Thanks for the time we had and may God continue to bless your ministry. I am so sorry you find the ads distracting. I am working on reducing the number of ads that appear on my page. Its a little trial and error right now since I migrated to a new company. Please bear with me while I work out the kinks. Thank you so much. I’ve been greatly inspired by your blog. God bless the works of your hand. Thank you so much for taking the time to let me know. God bless you! May the Lord God bless you. Thank you for sharing Jesus with the world. Landed on this website and it caught my attention. I bless the Lord for you. May he continue using you as his vessel. Thank you so much for taking the time to encourage me today!! Hi Alane – I am so glad that you found me! My guess is that what happened is that when you initially put your email in, the verification email you were sent landed in your spam folder and you didn’t see it. Please try again. Add my email: rosilind@rosilindjukic.com to your address list, and if you don’t receive the verification email please let me know. Thank you for the Quiet Time Journal!